“ The boar is named for its savagery, take away the letter F and replace it with a P. From whence and cloely the Greek Saugros, that is, wild, by which it’s called. Truly all, that are wild and irritable, we call wild marauders. 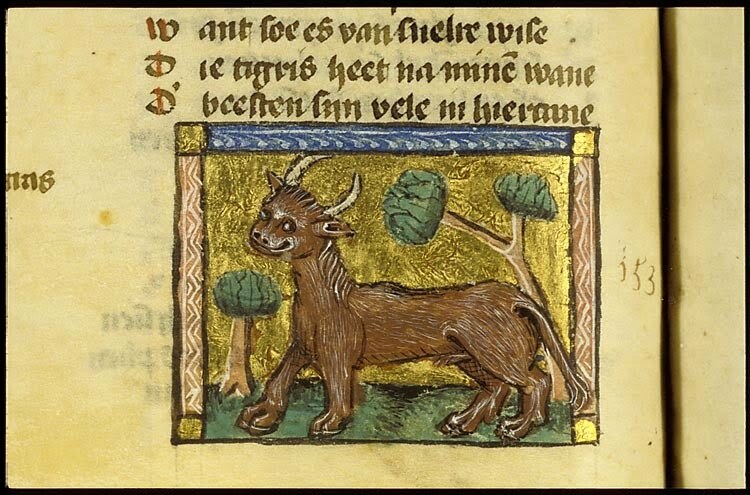 A bullock it is called, which began as a help to men in cultivating the earth, or which the pagans always and everywhere sacrifice to Zeus/Jupiter, never a bull. For the age of the sacrifice is considered. Taurus is the name in Greek, as it is here. Sticking true to his work’s name (Etymology, the origin of words), St. Isidore tries his darndest to relate the word “aper” (boar) to “feritate” (savagery) by replacing the “F” with a “P.” Words starting with the letter “f” could logically begin to start with “p” so maybe “aper” broke off from “feritate” at some point. Nonetheless, the connection isn’t quite as strong as some of Isidore’s other efforts. What’s really curious in this passage is Isidore’s description of the bull. Its agility would definitely be impressive given its size and its weight, but the description of its hair and flexible neck is quite odd. Do the opposing rows of hair suggest curliness? Is the flexible neck considered something to prize – a sort of flexibility in being commanded? These are both things that we’re left to wonder, as St. Isidore does not elaborate. The toughness of leather (being a cow’s skin, even on its back, after all) is also mentioned here, though the fact (likely the exaggeration) that it “refus[es] all weapons brought to bear against it” (“omne telum respuunt inmiti feritate” (12:29)) suggests that bulls just aren’t made like they used to be. The drying process must make the cow hide too stiff, and thus unable to be flexible enough to turn weapons any which way it pleases. Though he doesn’t do much of it here, St. Isidore does elaborate on cattle in this week’s regular Tuesday entry. And Beowulf strikes a blow against the dragon on Thursday, don’t miss it! This entry was posted in Latin, translation and tagged animals, Etymologiae, Isidore of Seville, medieval, St. Isidore by NSCZach. Bookmark the permalink.